Characteristics: A steep, high concrete ramp with 10 small radial gates in a row at the top. It generates a retentive stopper that provides an excellent blasting zone. Abingdon provides locals, particularly members of Abingdon’s Kingfisher Canoe Club, with a good alternative to the long drive to Chertsey. The weir is however, very much a one-move wonder, the move being the ‘blast’. No wonder that the club calls its annual fun rodeo, tongue in cheek, the KCC ‘Blast-a-thon’. Water level:Abingdon is usually at its best from May to July, at about the time that Hurley is dropping from 2 to 1 gates and when the Thames is at summer levels, but not too low. Any earlier and the stopper can be very sticky, you will be too busy surviving to pull any controlled moves. Any later, and you may find that all 10 gates are closed. Description: Looking upstream at the weir from the weir pool, looking from left to right, you will find the playboating venue, followed by two dangerous walled-in radial gates and then a walled-in row of sluice gates, followed finally by the lock. When the river is at the right level, you will find between 1 and 5 gates open. Expect to find alternate gates open (as opposed to two in a row) thanks to a helpful lock-keeper. 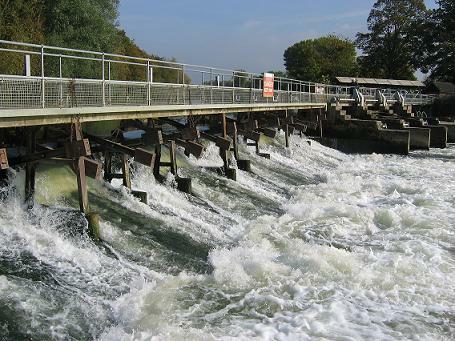 Each gate forms a small stop-per at the base of the weir, each less than 2m wide, with a thin film of water flowing down over a ramp that is about 30 degrees off horizontal, the result is an excellent venue for blasts. Abingdon may be a one-move wonder, but in the latest 2m long playboats a lot of fun can be had pulling just about every version of the blast imaginable. Stable forward blasts, reverse blasts, blast transition 360s, clean spins, hands only spins and finally the no hands clean spin. The weir pool is only 2-3 ft deep and is awash with debris. Hand rolling at Abingdon, you run the risk of cutting your hands; it’s safer to sit upside down for a while and wait for the boat to stop moving, then gingerly feel the river bed and push off a boulder. Other important points: The other hazard at weekends consists of anglers, who also like the weir pool. However, if you are relaxed about dodging their lines you’ll find that boaters and anglers can quite happily co-exist. You can put in at the road bridge in the town centre, parking in the car park to the south of the road bridge, but expect to find your car broken into when you return. Take care at the usual put in too (it is a quiet spot aside from anglers’ cars) and hide away all valuables. Directions: From Abingdon town centre follow the signs for Oxford. This will take you off the inner one-way system, north up ‘The Vineyard’. After 100m, after traffic lights, at a mini roundabout, head right following the signs for Radley. After 100m, turn right at the next mini roundabout into Barton Lane. After 200m, once the road has gradually veered to the left, take the 2nd right, where there is a community centre and car park. Don’t park in the car park, drive past it, turn left and park up just before the entrance to the Territorial Army centre, taking care not to cause an obstruction, carry your boat from here. Head 20m back towards the community centre and take the footpath to the left. Follow this for 50m as it curves to the right until you reach a small backwater. Go over the small footbridge, turn left and walk a further 50m until you reach the weir. With Thanks to Chris Wheeler.